Bali Souvenior Shop Jenggala Keramik offers unique design of fine ceramic for dinning wares. Jenggala Keramik produces high quality kitchenware, ceramic tableware, and so on. The products have been used by many companies in the world. The head office is located in Jimbaran has a showroom and café facilities for enjoy bevarage and a selection of light meals at the café. I found tableware of Jenggala Keramik on guidebook and I’m interesting in it. 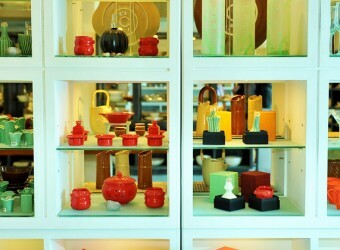 There are various types of ceramic products here and it was difficult for me to choose. Finally I bought one set of tableware with green frangipani design!